I won't go through the details but whatever happened, its got nothing to do with DSL dry-looping or not - and they are taking responsibility for where they may have gone wrong in the process. lbmofo - you were wrong. Completely. Good, I am wrong and you are right. Glad that you are finally dealing with this okay and someone is taking care of you. I understand your frustrations. There are multiple parties involved & sometimes beyond our control. If we had control of a single switch, we would make it happen. Also, our forum members are great assets & only offer to help. lbmofo wrote: Good, I am wrong and you are right. 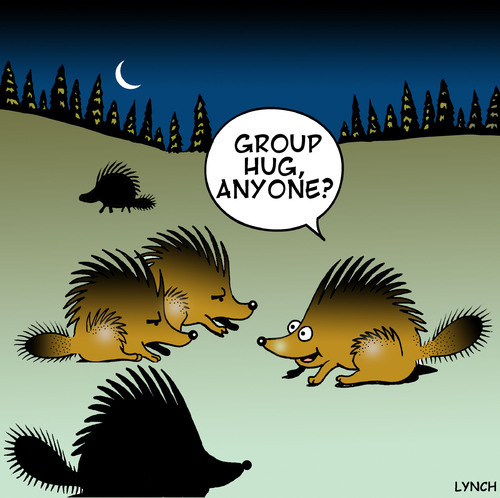 I think lbmofo needs a group hug! Porting is a delicate dance amongst 3 parties: the person initiating the request, the current telco of the line being ported, and the future telco of the line being ported. Add DSL to the complexity and it's a wonder there aren't more stories like this. But it's important to keep an eye on the prize, the eventual ditching of the traditional telco bills. And it's a waste of time and energy being mad at anyone because the process isn't completed flawlessly in 3 days. My port went smoothly except for the fact that the telco disconnected my DSL service a tad too early, like a week too early. I solved that problem by going with Comcast on a promotianl rate, so I'm saving even more money. Qwest was not happy! Too bad!! So sit back, relax, and look forward to a year from now when you've saved hundreds of dollars!! And I will reiterate what's been said, that the people on this forum are here to help. Welcome to the world of de-regulation. With all of the rules and regulations that congress inflicts on the Telecomm industry it is a wonder anything ever goes right. When they gave consumer the right to port their number to another carrier they did guarantee that it would painless to do it. Some carriers refuse to give up a number without a fight. Some drop the ball. There is a very good chance that if you were to have done the port with another carrier it would have either, a) worked like a charm, or, b) you would have gone crazier than you did with the Ooma port. My port of two numbers was done on time with no trouble. Kudos to Ooma. I suspect that does not happen all the time. I suspect the people working in porting are a harried lot, who leave work every evening and head to a sound deadened padded cell in their basement for a few hours to vent off steam. It is amazing that voice over IP works as well as it does. You are using the Internet to carry your calls. The Internet is inherently unstable and not controlled by any one entitiy except possibly by Al Gore, who says he invented it. A few bit torrents operating in the neighborhood could drag your cable service down and affect your VoIP phones. I have had Ooma a little over a month and so far it has been rather good. There are a few problems. One is the occasional touch-tone sound, which is discussed in another thread. Another is a problem with call waiting, for which I am awaiting a reply from Ooma. I was paying Verizon $55 per month and another VoIP carrier $22 a month, or $77 total. With Ooma I will pay $14 a month, a savings of $63 a month or over $700 per year. That savings comes at a cost. I am no longer assured of a perfect call every time and never being down, even during a power outage. That is a trade-off I have made. With that savings I get a log of all calls, I can check voice mail without tying up the phone, and I can re-configure some features from my PC. So you had yourself a rough time with a number port. Welcome to the crowd, and it is a big crowd. I got lucky this time porting not one but two numbers from two different carriers to Ooma without a hitch. I hope the service works out for you. Just remember, if you decide to find another carrier you get to go through the porting process all over again. BTW - My relationship with Ooma is one of a customer. I do not work in the telecomm industry and I have no financial interest in Ooma. BackupBob wrote: So you had yourself a rough time with a number port. Welcome to the crowd, and it is a big crowd. I got lucky this time porting not one but two numbers from two different carriers to Ooma without a hitch. I hope the service works out for you. Just remember, if you decide to find another carrier you get to go through the porting process all over again. Do you realize that the only reason I got a call from a high level OOMA employee to explain where things were at... and to get ti fixed... BECAUSE I CREATED THIS THREAD? THeir communications with me never arrived. My escaltion request went nowhere. I finally got a call from management after OOMA READ THIS THREAD. 99% of everything that I complained about was OOMA's fault - and yes, I spoke with them and they agreed that their instructions sucked, the LOA form sucked, the call center reps sucked and gave me wrong information, OOMA never sent me the email they claimed to have sent me - and Verizon's only responsibility here was an odd anomaly. My entire point here was that OOMA's process and people have under-delivered. And their management concurred with me. OOMA doesn't actually save me money. It COSTS Me money. I know you all find that hard to believe, but it's true. I can use the comcast VOIP that is included with my cable/internet bundle for free in essence since NOT having that in my comcast bundle JACKS UP THE PRICE at comcast. I could get essentialy the same hassle from Comcast and not have bought a telo and not have to spend $10 a month for premier. I don't know why everyone says *hey, so what if its ugly, you'll be happy later" when all I am trying to do is fix OOMA's end of things so that it's easier for all future noobs! I've never bitched about any other carrier's culpability. I understand that issues will come up between carriers. I GET THAT. I only speak to OOMAS failures during this. In the end price isn't the issue. It's service- technical and port support. And their port support side of the process/ interaction during the port was deplorable to date. p.s. And given the variety of incorrect info I got from the call center (and that includes the person that answered the phone, the technical support specialist I was sent to (Who left me on hold 20+ minutes + wrong info) as well as the supervisor who ultimately got most of it right but still some wrong- tells me that they clearly need to get their act together. HOW DO YOU ALL MISS THAT? Or do only uber-ooma-lovers post here? It's as if you all miss the forest for the trees. bonflizubi wrote: HOW DO YOU ALL MISS THAT? Or do only uber-ooma-lovers post here? It's as if you all miss the forest for the trees. I guess we all should thank you for enlightening us. We appreciate your kind contribution to the forum and to the general well being of ooma users everywhere. And as to the uber thing... I have a Telo and a hub - I think that the uber is still in development and maybe some beta testers have used it but not me. Is it as cool as the Telo? How can I get one? southsound wrote: I guess we all should thank you for enlightening us. We appreciate your kind contribution to the forum and to the general well being of ooma users everywhere. SouthSound, I couldn't agree more. The level of enlightenment brought forth is extraordinary to say the least!